How's this for an endorsement . . . "Life Magazine recently named Saugatuck, Michigan as one of the top 8 places in the country for a perfect summer weekend escape!" Not one of the top 8 in the Midwest, or the top 8 on Lake Michigan, but the top 8 in the country!!! 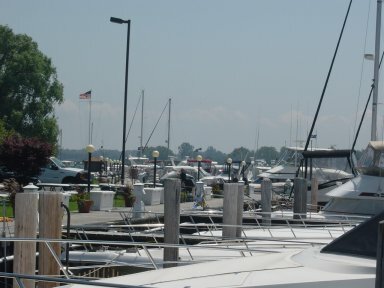 I'm not sure how Life magazine goes about rating a summer weekend escape, but I can tell you that our family loves Saugatuck for its unique waterfront, shopping and overall abundance of things to do. 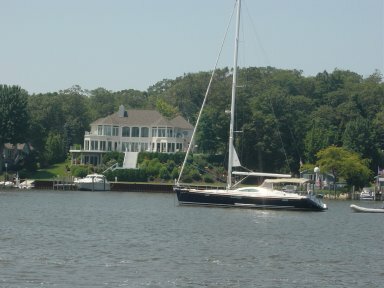 It has a little bit of 'most everything, and a boatload of shopping. This is quaint shopping U.S.A. The culture is light on the Midwest and a little heavy on the "artsy-fartsy" (sorry, but everyone uses that term to describe Saugatuck). This town is known for the arts. Such as the Saugatuck Center for the Arts, which houses a professional New York-style theater. There is also a film festival every June, "The Waterfront Film Festival", which is becoming quite popular amongst the Hollywood crowd. Summer weekends hold jazz festivals and chamber music festivals. Or, you can just make your own art; they will help you at the Express Yourself Art Barn where you can create your own masterpiece. If it is anywhere near lunch or dinner, or just time for a snack, we head right away to The Mermaid. 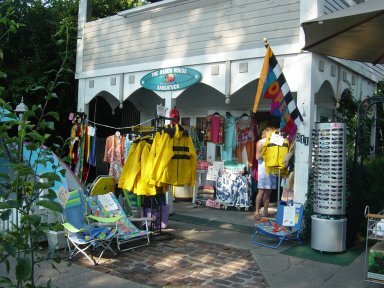 The Mermaid is the perfect beach town "get in the mood" to shop stop. It is also a great "break from anything" stop. And three, it is outside, with miles of boardwalk so the kids don't get too bored! 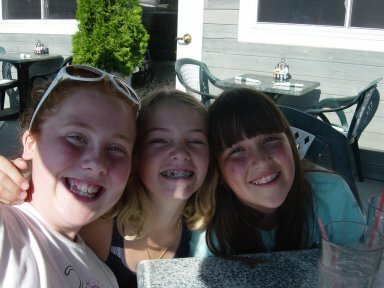 Here is Anna (middle) having another great time with her friends, Maddie and Alex. 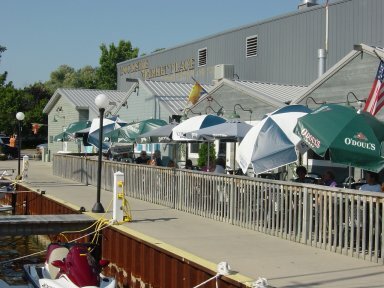 The Mermaid is just one of many restaurants that sit on the water in Saugatuck. But it just happens to be the one that fits us best. Check them all out and tell us what you think. This is what Saugatuck (or as our kids call it "Soggy Duck") is known for. Even if you are not the biggest fan of shopping, you will enjoy a day amongst the shops and alleys of this charming town. I say "alleys", because one of the unique things about Saugatuck is how some stores don't have store fronts, they are simply in an alley where things are displayed for sale. Make sure you venture down these alleys - this can be where the most unique things and best bargains are found. 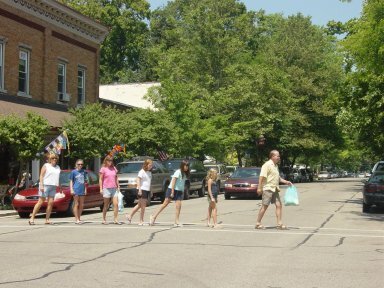 Shopping is definitely one of the great family adventures we enjoy in Saugatuck. It is outside and sprinkled with ice cream shops and fudge making stores (kids), as well as pubs and tiki huts (for those who don't consider shopping a sport), and enough variety so even the pickiest shopper is toting a bag at the end of the day. 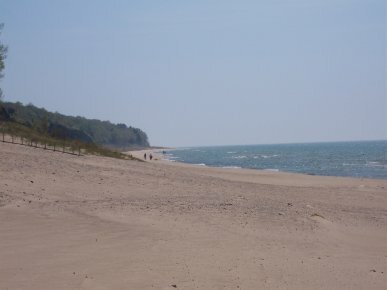 If you can pull away from downtown, you must take a trip to Oval Beach in Saugatuck. But once again why take our word for it? Conde Naste magazine ranks Oval Beach in the top 25 in the world. That is some heavy praise for one of our favorite beaches. Part of the fun of going to Oval Beach is getting there. The best route for the adventurous is to ride across the Kalamazoo River on a hand-pulled chain ferry that you pick up right from the boardwalk. Then climb almost 300 steps to the top of Mt. Baldhead and finally take a walk (or run) down the grassy coastal dune. Beaches just can't be taken for granted on Lake Michigan, they need to be experienced. 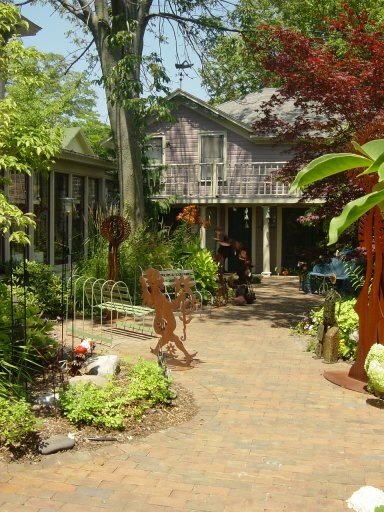 Tip number one for where to stay in Saugatuck is more about timing than it is about the place. Book early or you may not find a cottage, or rental of any type. This is one busy place and tends to fill up quick. Tip number two is to not forget about the Bed & Breakfasts. This town is full of them and they each have a great location. Tip number 3 is to remember this is a pretty active town. If you like that, and want to be in the middle of the action, you have to find out how far your rental is from town. If you are looking for a quieter time, then make sure you are somewhat away from the shops and boardwalk. It is pretty easy to find the perfect location if you look early enough. 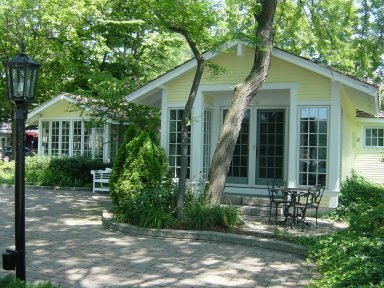 Check out our Saugatuck Rentals section for that spot that puts you on vacation the minute you walk in.